The Angularli deposit is located within the King River-Wellington Range Joint Venture, which is divided 75 percent to Vimy Resources and 25 percent to Rio Tinto. Vimy Resources (ASX:VMY) reports encouraging results from its first drilling program at the Alligator River Project in Arnhem Land, Northern Territory. The Angularli deposit is located within the King River-Wellington Range Joint Venture (75 percent Vimy Resources, 25 percent Rio Tinto (ASX:RIO). The wide-spaced drilling program focused on the discovery of broad alteration haloes, similar to those surrounding the Angularli deposit, along strike and within parallel structures. Drilling comprised ten reverse circulation (RC) drill holes for a total of 2,868m. Vimy’s managing director and CEO Mike Young said; “Our initial drill program has proved successful with immediate progress made at the Alligator River Project. Drilling has identified a prospective fault zone a short distance from the existing Angularli orebody. This will be our primary focus as we prioritise next year’s work program. 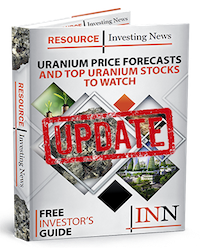 All the key ingredients for uranium mineralisation appear to be present, with strong hydrothermal alteration in the overlying sandstone cover and uranium anomalism at the unconformity.